This four-day, instructor-led course explains how to implement and configure new Windows Server 2016 features and functionality. This course is for information technology (IT) professionals who want to upgrade their technical skills from Windows Server 2008 or Windows Server 2012 to Windows Server 2016. This course presumes a high level of knowledge about previous Windows Server technologies and skills equivalent to the Microsoft Certified Solutions Associate (MCSA): Windows Server 2008 or Windows Server 2012 credential. This course is not a product-upgrade course, detailing considerations for migrating and upgrading students’ specific environment to Windows Server 2016. 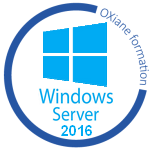 Rather, this course provides updates to students' existing Windows Server knowledge and skills, as they pertain to Windows Server 2016. This module provides an overview of Windows Server 2016 containers. Additionally, it explains how to deploy, install, configure, and manage containers in Windows Server 2016. Install and configure Windows Server 2016. Describe storage in Windows Server 2016. Implement directory services. Implement Active Directory Federation Services (AD FS). Describe networking. Implement Hyper-V.
Configure advanced networking features. Implement software-defined networking. Implement remote access. Deploy and manage Windows and Hyper-V containers. Implement failover clustering. Implement failover clustering by using virtual machines.